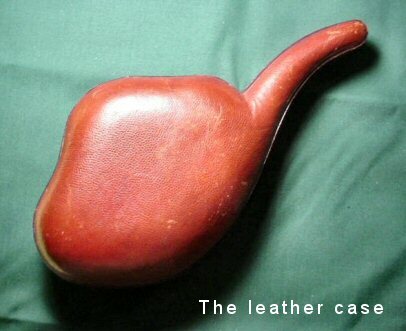 DESCRIPTION: Here is one of the more unusual German traditional phenomenon. 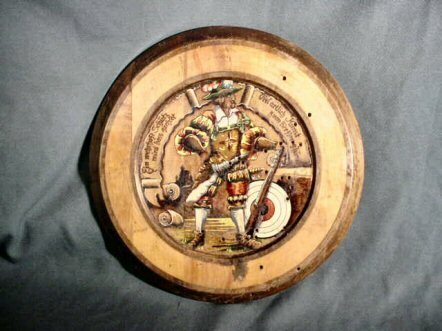 From ancient times German artists have produced wonderful paintings on wooden plaques, sometimes beer-barrel tops with the express purpose of being targets. 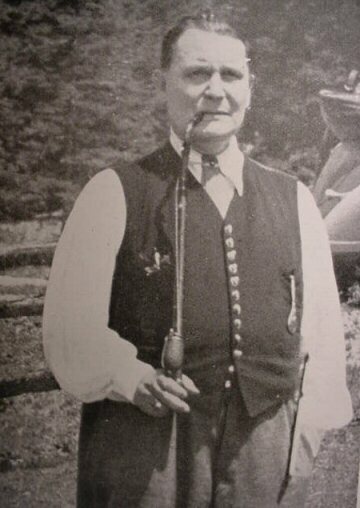 The winning shooter of the day is declared Königshutz, king shooter, and he gets the target as his prize. 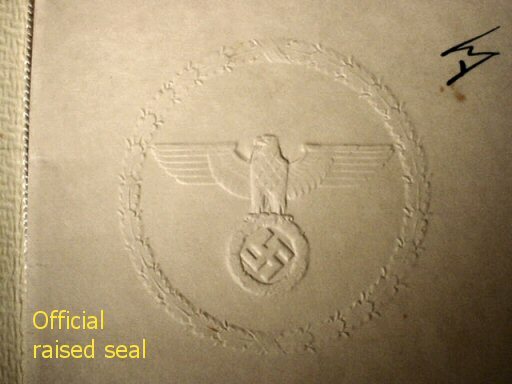 The subjects can be forest animals, military soldiers and equipment, Munich maids, even religious subjects. There is no significance to the shooting at revered subjects. 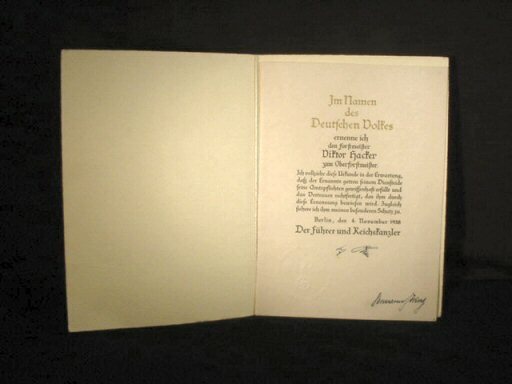 It simply is a target and the nicer or the most meaningful it is the better it will look on the König’s wall. 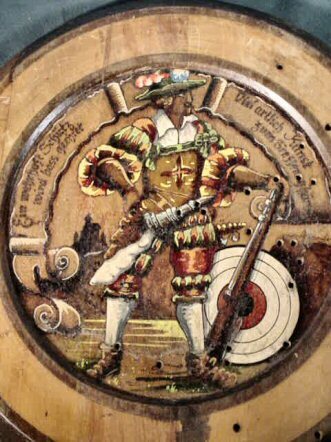 This one is a beauty depicting a Landsknechtsoldat in full, fancy attire with his weapons. 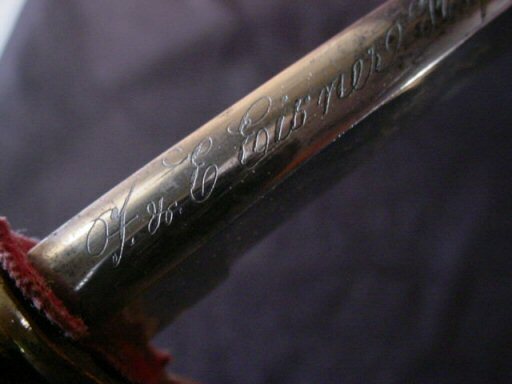 The wording has something to do with military protection and fine art that attends our competition. This seems to indicate a military shooting contest of sorts. The shots fired appear to all be to the right of the target. 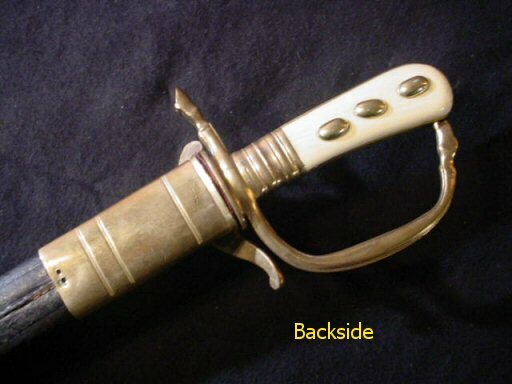 Probably the winning shot was the one piercing the middle of the Landsknecht’s sword or dagger. This is indicated by what is left of a red sticker that was over the particular bullet hole in the back of the target. 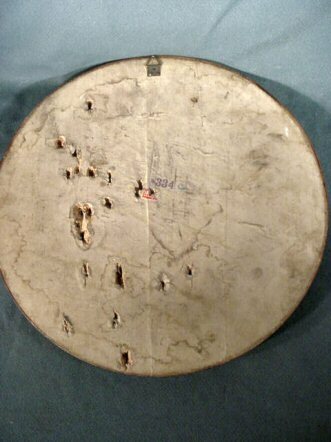 The piece measures 15 ½ inches in diameter with 20 bullet holes that looks like they were fired by a .22-cal. 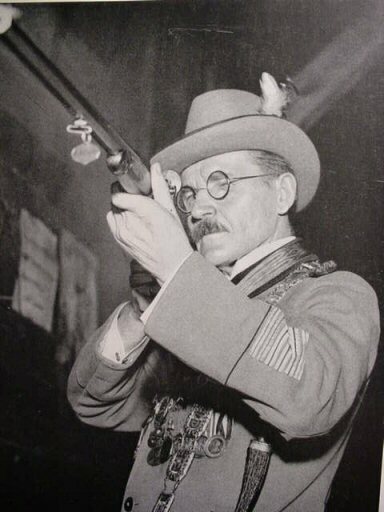 pistol or rifle. This is truly a classic example of this shooting sport. A great wall piece. 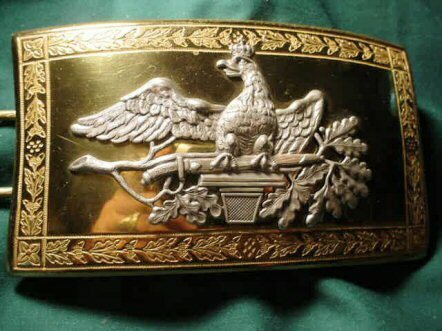 DESCRIPTION: Here is the mother of all buckles and in practically mint condition. 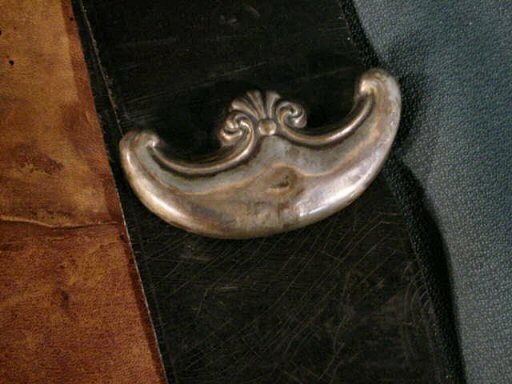 It is a huge buckle measuring 5 x 3 inches. 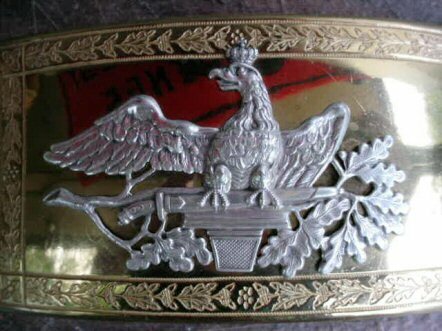 The eagle in the center of the gilded-brass buckle is in pure silver and is the insignia used by the Kaiser personally for his Forestry Service administrators and officials. 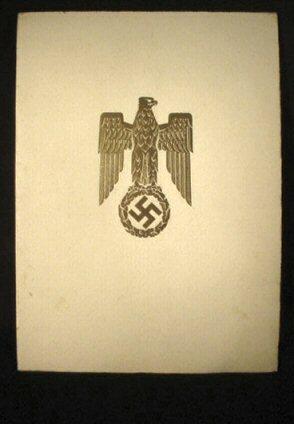 The Kaiser eagle sits upon a Hirschfänger, or hunting sword or dagger, and is supported by oak leaves and branches. This sits on a plinth. 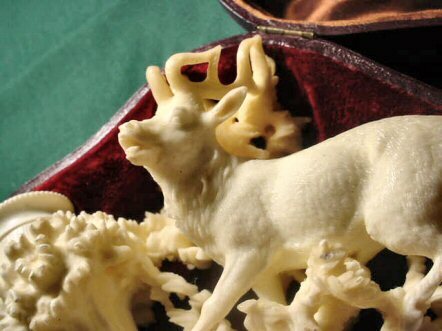 The spectacular detail is almost beyond comprehension. 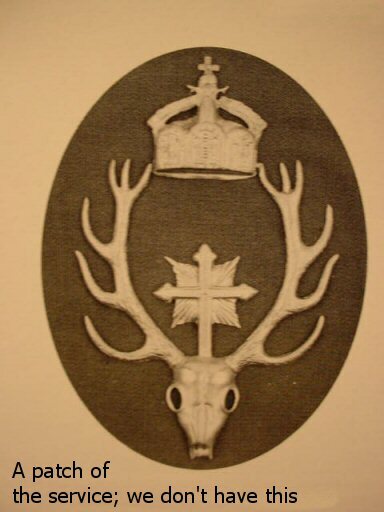 Look at the picture of the feathers, crown, and eagle’s head! 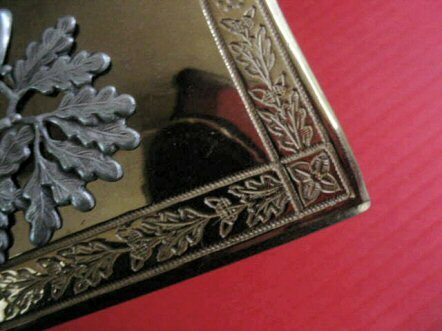 The edges of the buckle have an oak-leaf design in simulated engraving. 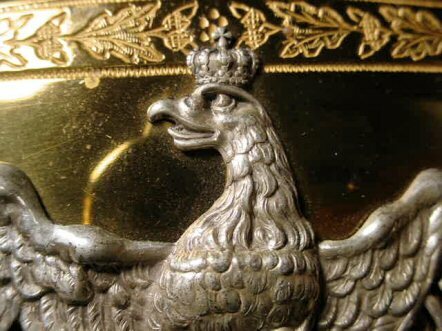 The eagle is secured with tiny screws and nuts. 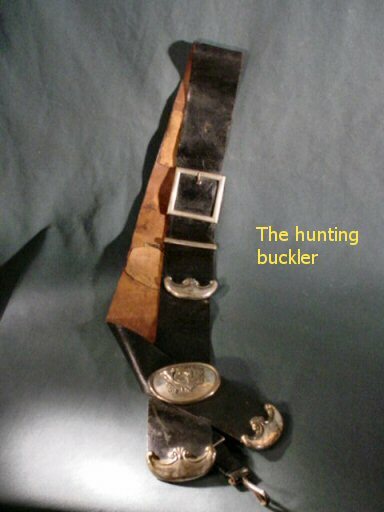 The catch for the buckle fastener has been removed for some odd reason??? 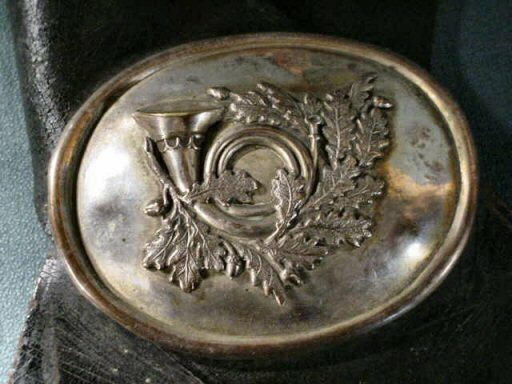 This is very probably the buckle for a very high forestry official, possibly even the Kaiser’s chief forest master. We would have to say it’s the prettiest piece of German forestry equipment we have even seen. 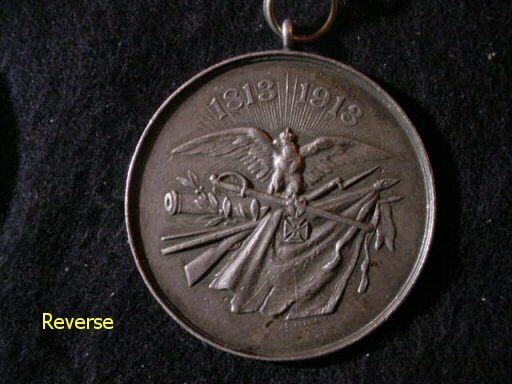 DESCRIPTION: Here is a great-looking fob, probably from the turn of the century up to the 1920’s. 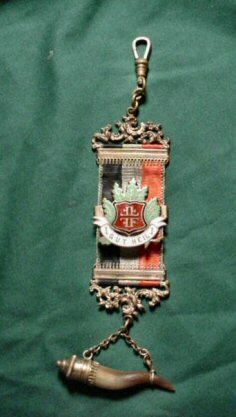 The central design is an enameled shield that features the insignia of the Deutsches Turn Verein (athletic association). 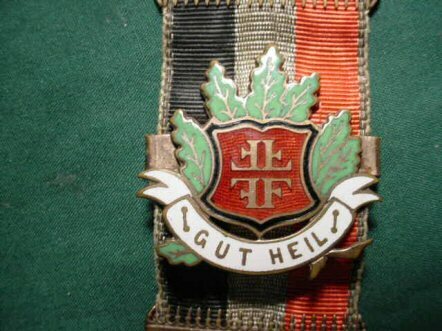 This is topped with oak leaves with a scroll underneath with “Gut Heil,” the slogan of the organization underneath. This means a good greeting. The configuration of the four “F”’s in the shield stands for “Frisch, Frei, Frolich, Fromm” meaning “Fresh, free, joyful, and pious,” the slogan of the group. 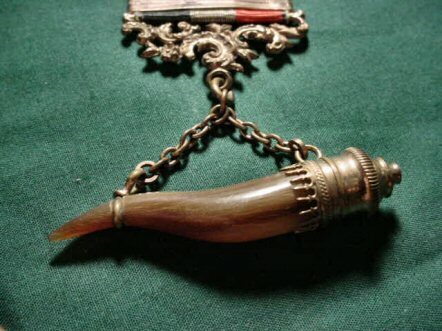 This particular fob as evidently owned by a gentleman who was also a sportsman (hunter) evidenced by the beautiful brass-capped powder horn that suspends from a chain. 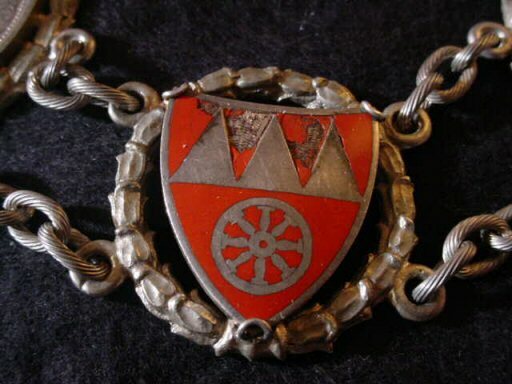 All in all, this is a very nicely done piece of Germanic jewelry. 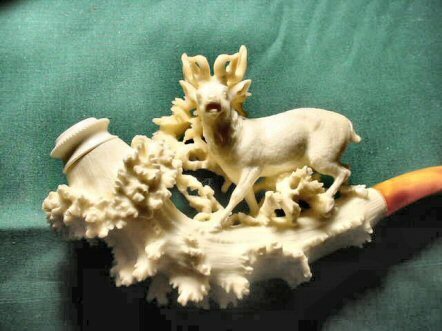 DESCRIPTION: Here is a very beautiful Shutzenprize, or shooting prize. 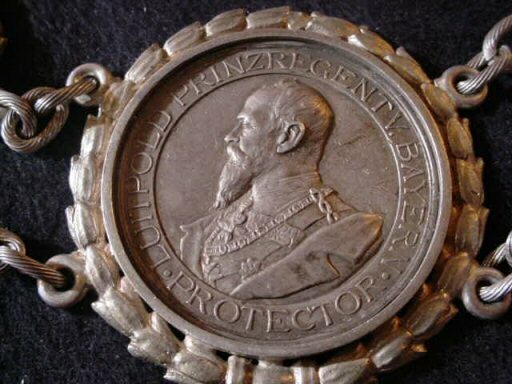 This would be given to the Shutzenkönig, or king of the match. 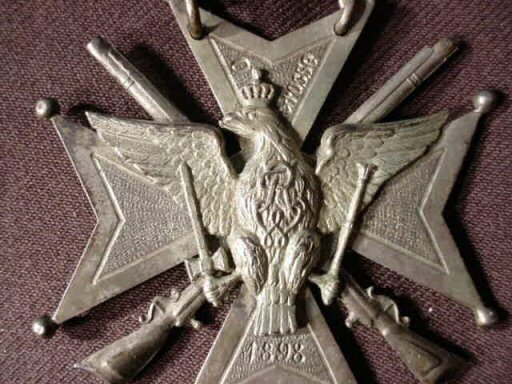 This one is dated 1898, and bears the Prussian Eagle in the middle of a crown-bedecked Maltese Cross with Shutzenrifles behind. 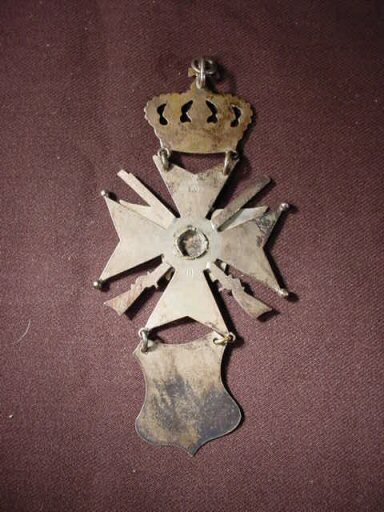 From the cross hangs a shield with either the name of the König, or the place of the event (no longer quite discernable). 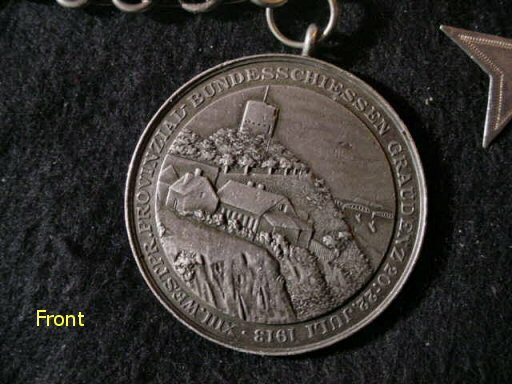 The back shows the ‘800’ silver designation (it is silver). 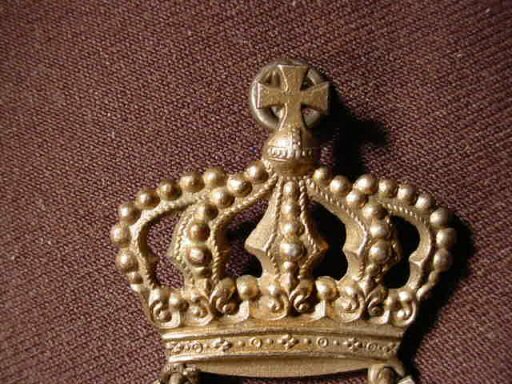 It measures 5 inches from the cross on the crown to the bottom of the shield. This is quite dramatic and with all the Imperial Prussian flair. 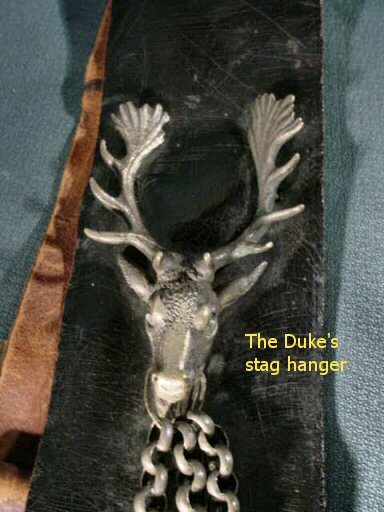 to the Duke's personal crest. 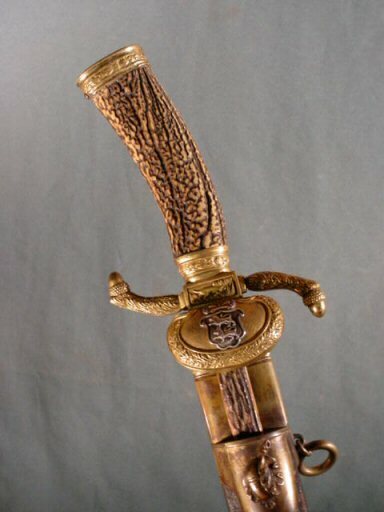 DESCRIPTION: Here in all its regal glory is the magnificent hunting sidearm of Herzog (Duke) Albrecht Eugen of the German state of Württemberg. 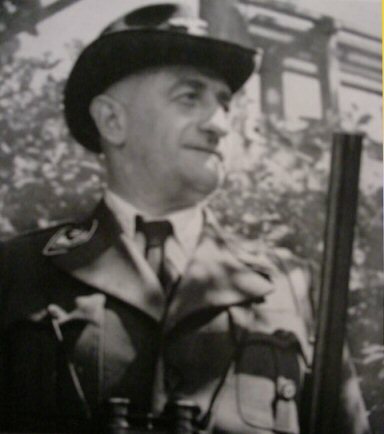 He was a successful German army commander on the Western Front and led the Germany Fourth Army through the Ardennes at the start of the war in August 1914, advancing to the east of the River Marne by September in time for the First Battle of the Marne. During the so-called ‘Race to the Sea’ in October, his army was transferred to Flanders, and led the offensives against Ypres during 1914 and 1915, which included the first use of gas on the Western Front at the start of the Second Battle of Ypres. 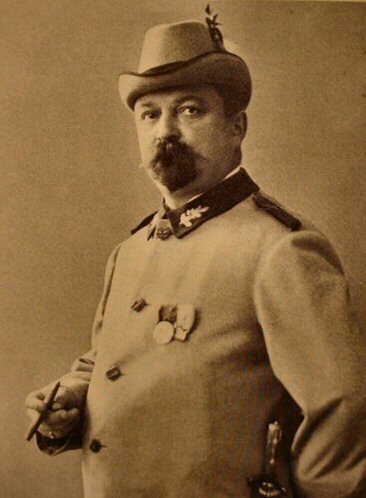 Promoted during the army command reorganization of August 1916, the Field Marshal, Duke Albrecht was given command of the newly-formed ‘Army Group Albrecht’ in February 1917, responsible for the less active southern sector of the Western Front, where he remained until the armistice. With the German revolutions that followed the war, Albrecht lost his royal inheritance, retiring instead to his castle in 1921. 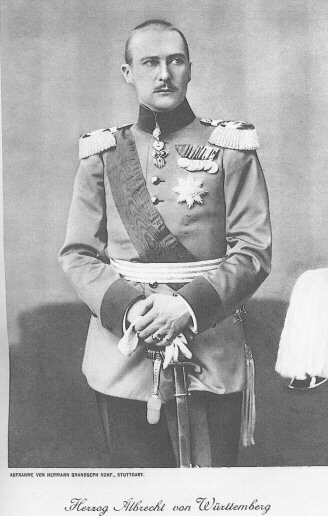 Albrecht, Duke of Württemberg, died in 1939. He was a very dashing son of royalty—handsome and extremely lettered. 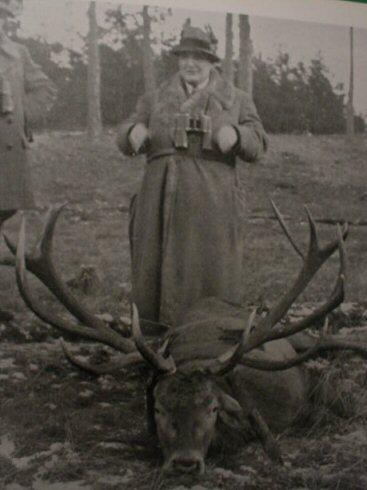 His great passion was the Sport of Kings (the royal hunt) and the den of his estate, whose walls were covered with the many trophies of his sport. 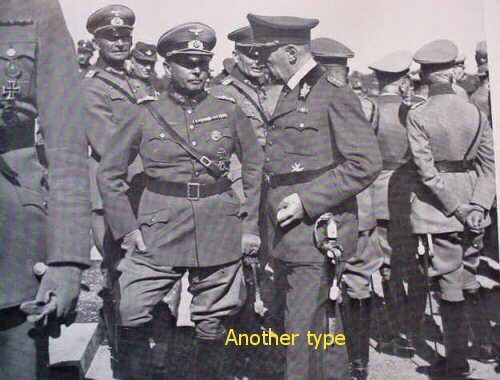 Because of common interests, he was a rather close friend of Hermann Göring, the German Reichsmarschal. He, as nobility, disdained any parliamentary politics and was a monarchist to the end. 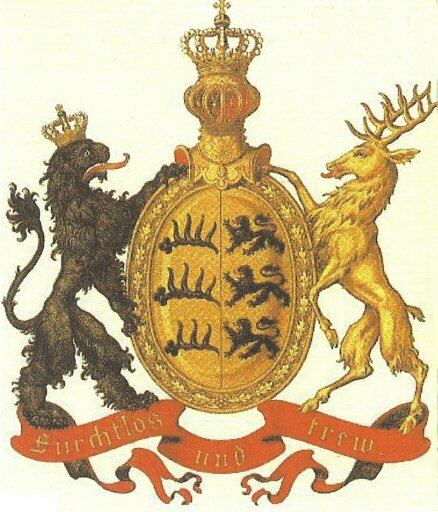 He, like so many Germanic royalty, desired the return of the Hohenzollern monarchy. 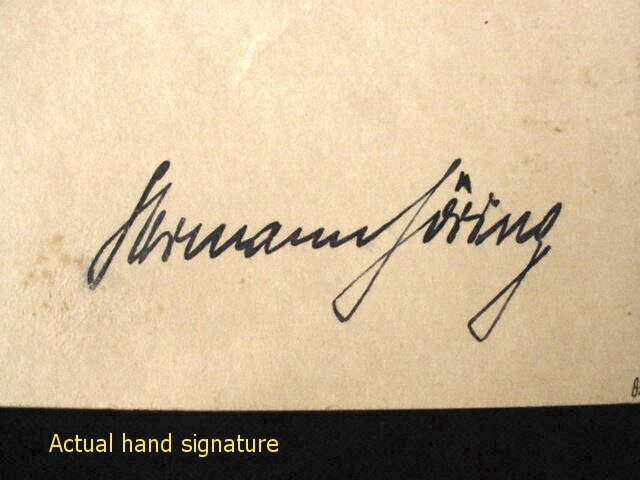 He was actually arrested for refusing to vote in the elections of 1933, but mostly for announcing as much. 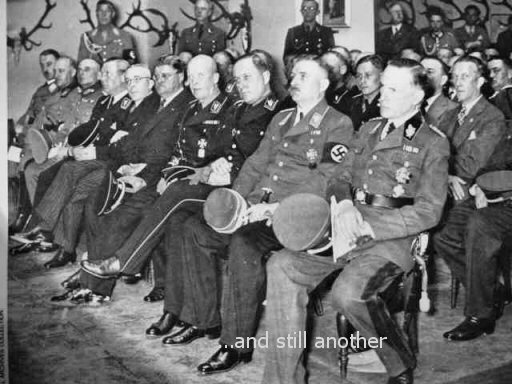 He was quickly released, however, as Adolf Hitler wanted no grief with the landed gentry or royals. 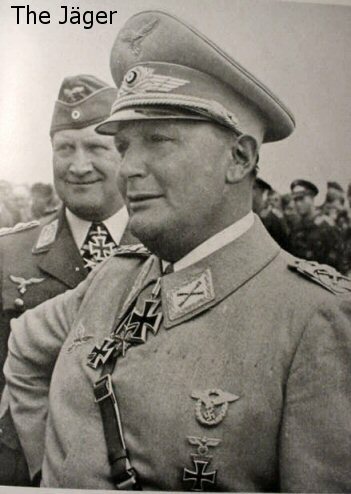 This was truly a fascinating man and a military hero on the German scene. 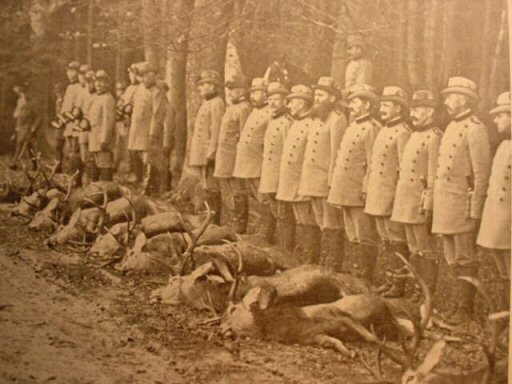 The hunting lodge of the duke was near the forest area adjacent to Stuttgart. 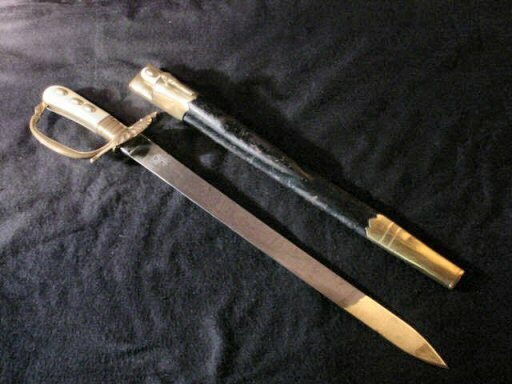 The hunting sword—it could also be called dagger but for its length—is still called a Hirschfänger in the German terminology this is a very long example; 30 inches in its scabbard. 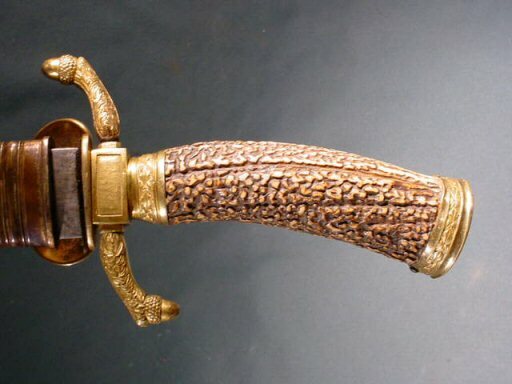 It is clearly a utilitarian weapon of the hunt and shows usage through many field expeditions, but it also has a rugged beauty of its own. 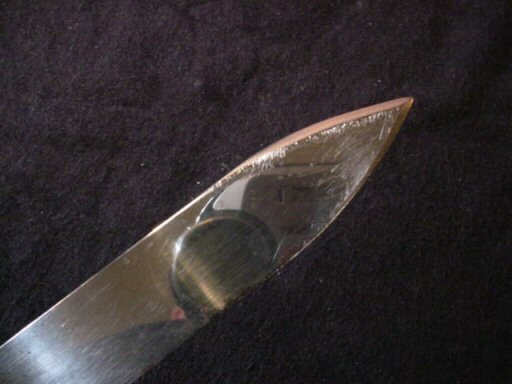 It is structured like so many other related Germanic hunting swords and daggers, but has the royal ducal escutcheon on the clamshell guard. 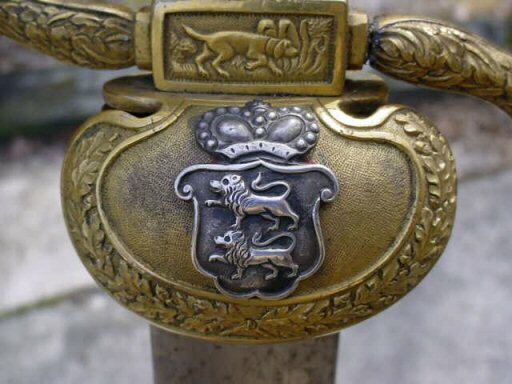 This consists of a shield in silver bearing two walking lions and above is the crown of the monarchy of Württemberg. 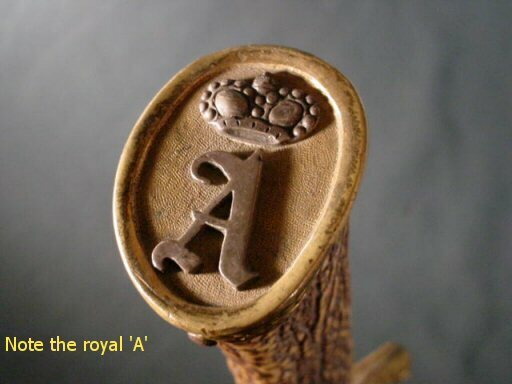 The crown is shown on the blade and on the top of the grip (hilt), and under each of the crowns is the letter ‘A,’ for Albrecht, signifying that this royal Hirschfänger was specifically crafted for him. 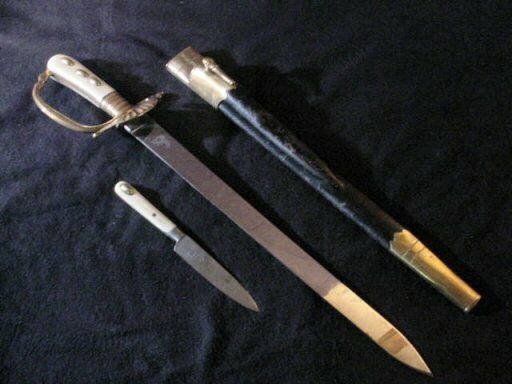 This fact is indisputable, as everything, including the leather, silver-decorated hunting sash, bears the exact same gothic ‘A.’ The sash that goes with the dagger is very seldom seen with these articles. 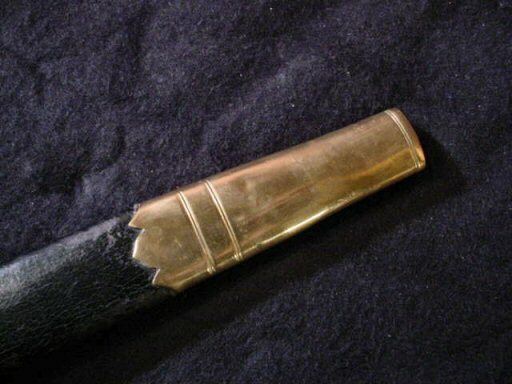 This is the accouterment that the weapon is suspended from during the hunt or the review. 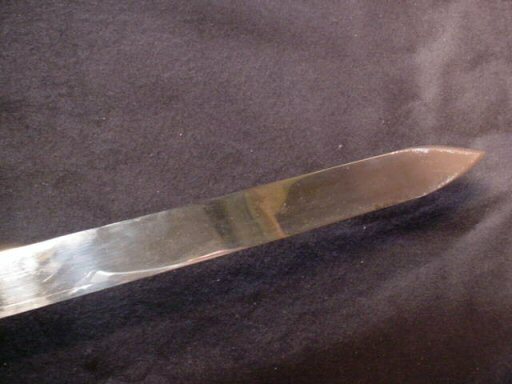 This measures on one side 33 inches and is about 3 inches wide. 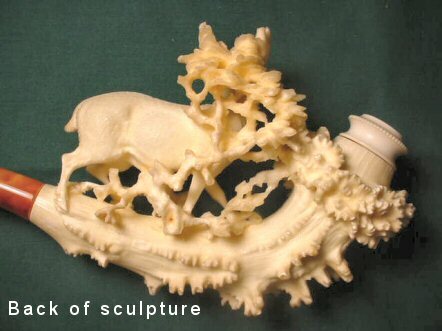 It has a fallow-deer-head-relief figure from which a chain is suspended that has crown of the type that typifies a royal duke (ducal crown). 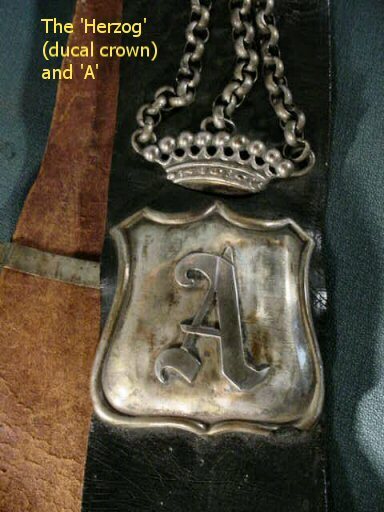 Under this is the shield with the large ‘A’ in the exact manner as on the grip top and blade. 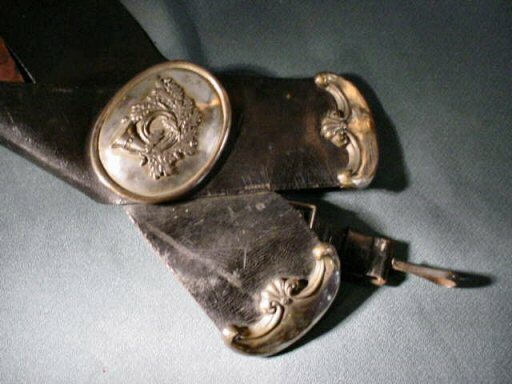 The backside of the strap has a hunting horn and oak-leaf design with various bucklers. 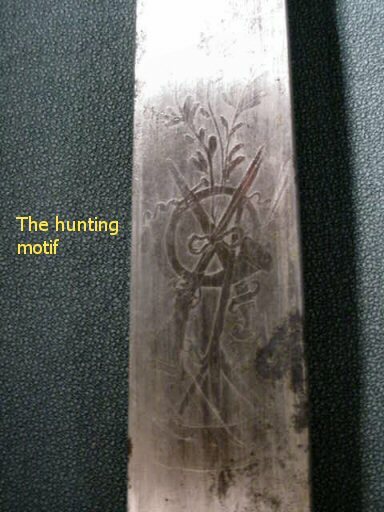 The blade as we have indicated is quite worn form extensive use by the duke over a period of many years, but all the etching is clearly discernable, but is hard to pick up with camera. 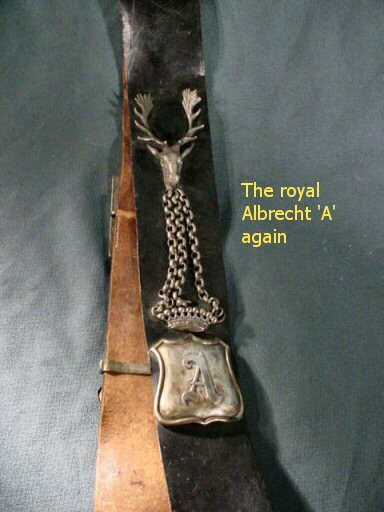 The most important etching is of course the crown with the ‘A’ for Albrecht. 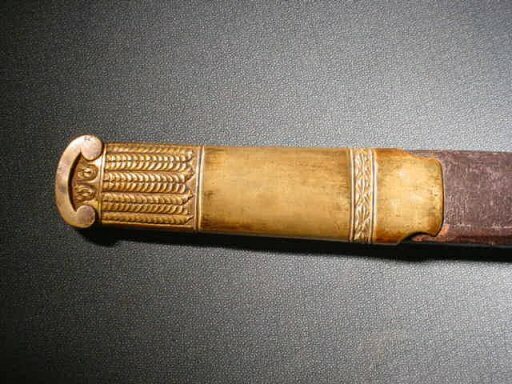 In the scabbard is the typical skinning knife securely nestled in the brass pocket device decorated with leaf protrusion. 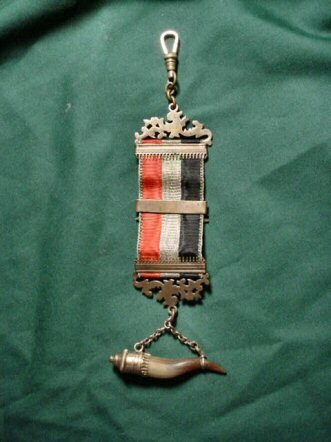 This device is placed in the manner that it is to implement yet another way of wearing the piece. There would have been in the hunting properties of the duke, a frog. 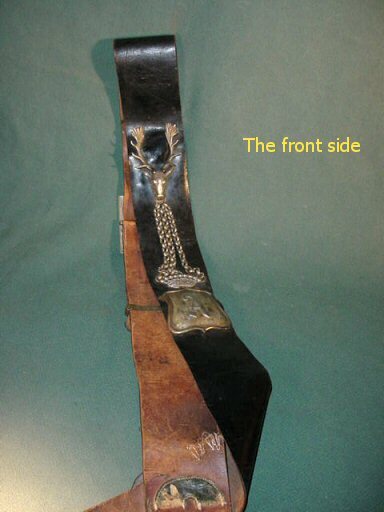 This is a leather carry device that allows the sword to be carried in a horizontal position (sans the sash mounting). 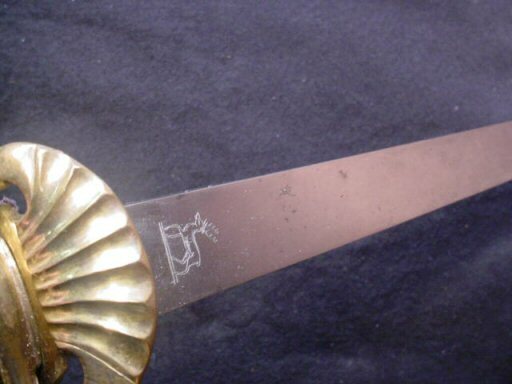 So ladies and gentlemen Germania International, LLC presents once again a fantastic piece of royal Germanic history for the museum or advanced collector. We are most proud that we have been chosen to research and present this prestigious and important treasure. 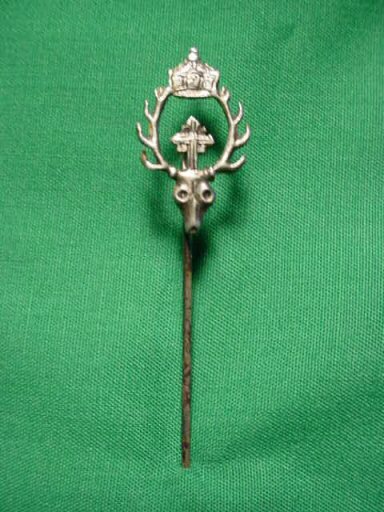 DESCRIPTION: This great-looking stickpin is a depiction of the Saint Hubertus Stag with Christian Cross and Imperial Prussian Crown. 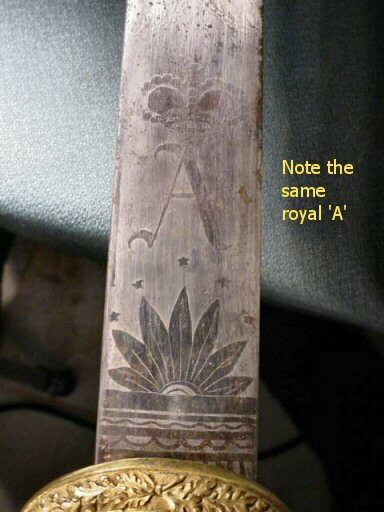 The piece is clearly marked with the high-grade ‘900.’ This is a beautiful and important piece of Imperial history. We have only four of these. 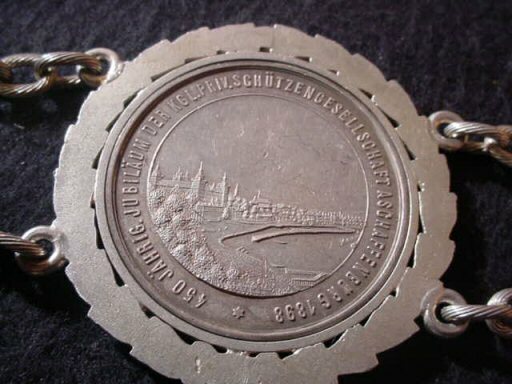 DESCRIPTION: Here is without a doubt the absolutely most beautiful Schützenketten, shooting chain, ever found. As far as we are concerned its beauty abounds in each and every piece that makes up its entirety. It would take pages to entirely describe each coin and medallion used to construct this utterly magnificent work of the silversmith’s art. 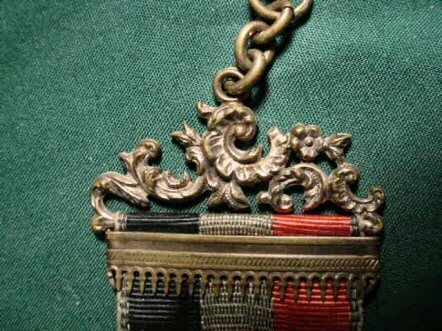 First of all, it needs to be explained that the main subject—the award—is always the central piece, while the supporting links are usually coins framed by the silversmith in such a fashion as to give emphasis to that highly coveted prize. 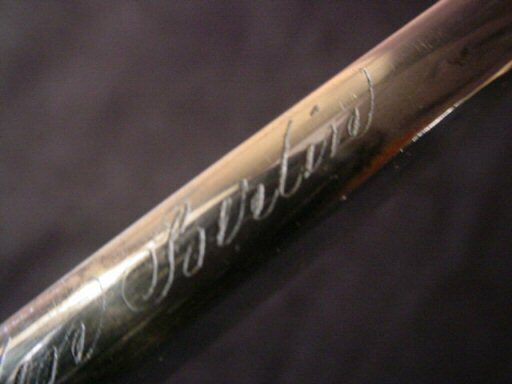 In this case we know the shooting king was from the town of Aschaffenburg because of two of the silver adornments. 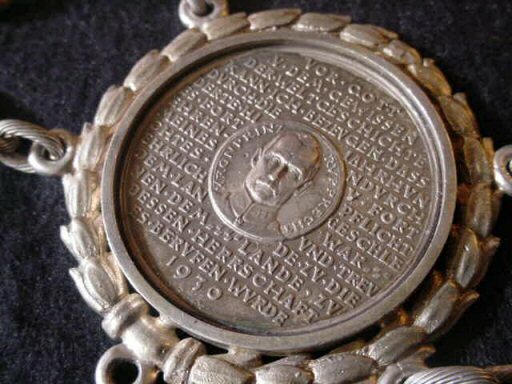 On the very back medallion which, by the way, is the largest of the medallions with the exception of the Prussian prize, which we will get to later. 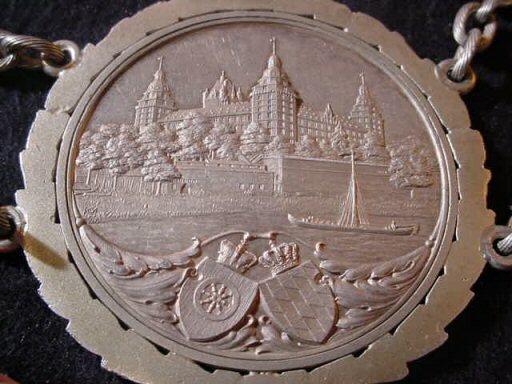 Also, this town is shown on what we call the central link, which is the silver-gilded piece with a rifle laying over a target with the Bavarian crown surmounting this. 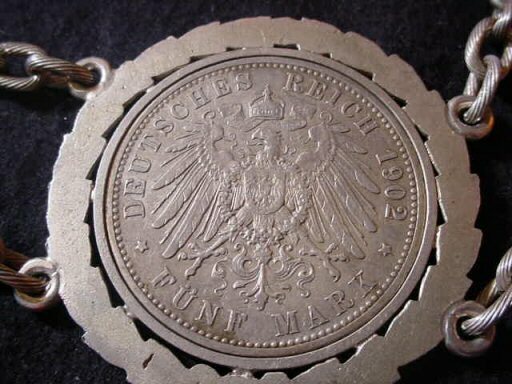 Some of the coins and medallions (nine of them) could be extremely rare and very valuable, but we do not have a way to check them out. 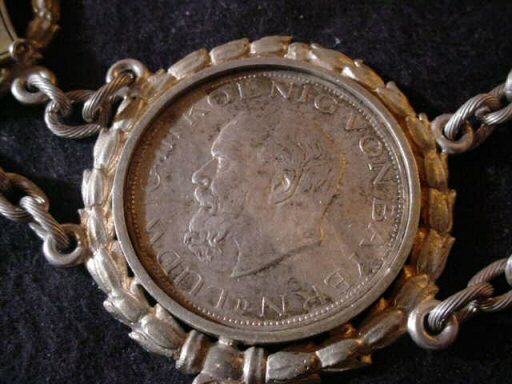 It is apparent that the man putting this chain together chose only pieces that were in almost uncirculated condition. The detail of these items is astounding. 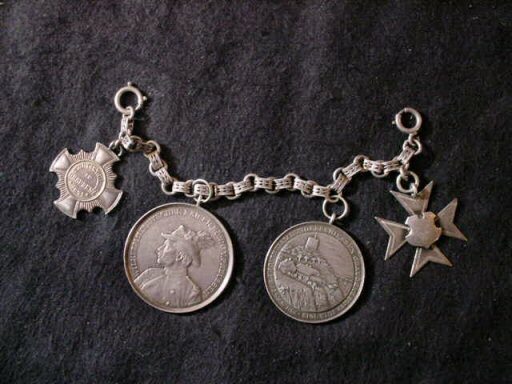 Four of them are 5-mark coins and the others are important medallions. The large Aschaffenburg piece at the rear is to commemorate the 100th year of the city’s becoming Bavarian. 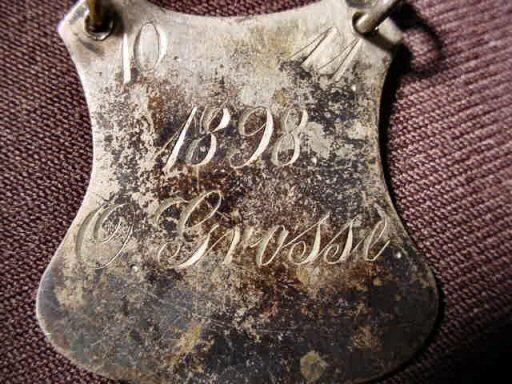 The entire chain gives evidence that the wearer was Bavarian. 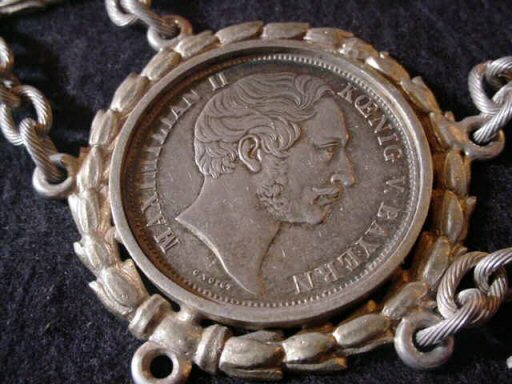 Bavarian coins and medals and the KKSB found on at least two piece show that the chain was produced and presented under the auspices of the group that was in a certain competition class: Klien Kaliber Schützen, Klasse B—Small-caliber Shooting, Class B. 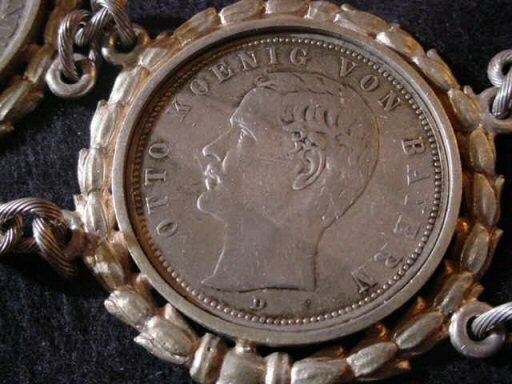 The latest date on the prize is 1924, on the item with the Bavarian crown. This is normal because the chains were often handed down when won by other winners through the years. 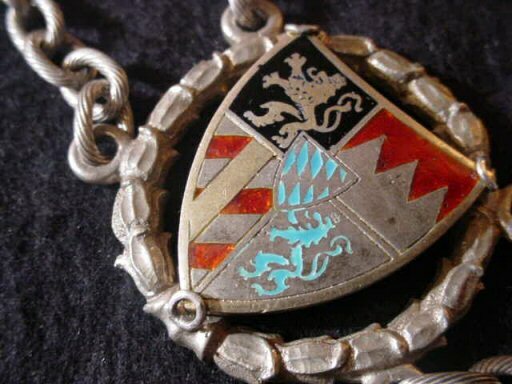 The enameled shields represent various Bavarian districts that have sponsored these shooting contests; however, in one case the enameled shield is Prussian and that leads us to the grand finale; the central badge that is the pendant (the largest piece) is personally presented to the Schützenkönig by the Prince of Prussia to someone who won top honors for a shooting contest sponsored by the Shooting Guild in Schoeneck in 1850. 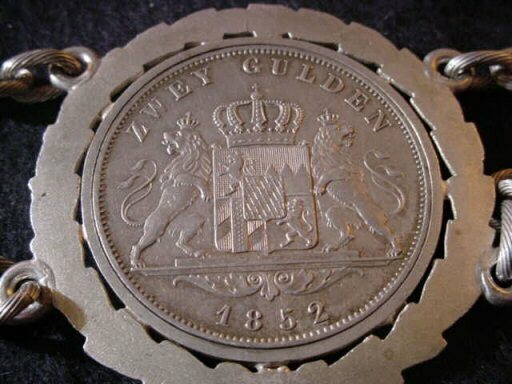 We are not sure if 1850 was the year of the actual award or the year that the contest and prize was instituted. 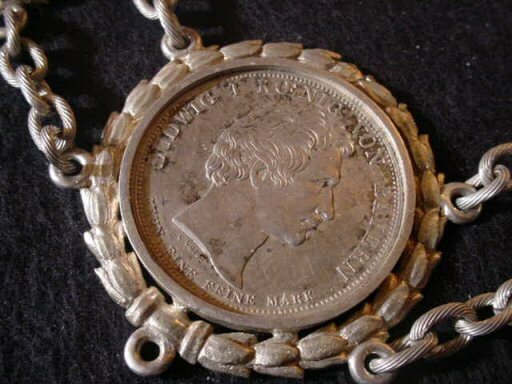 The medallion is astonishingly beautiful in genuine silver. 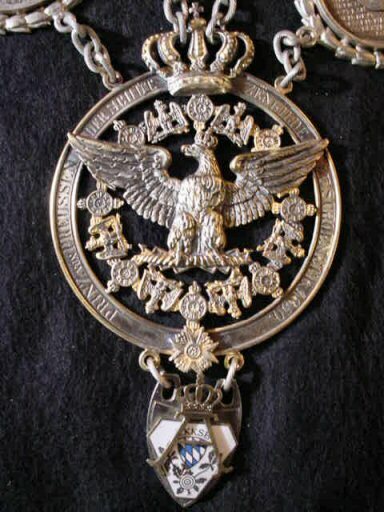 It features the royal Hohenzollern crowned eagle with the Order of the Black Eagle surrounding it. 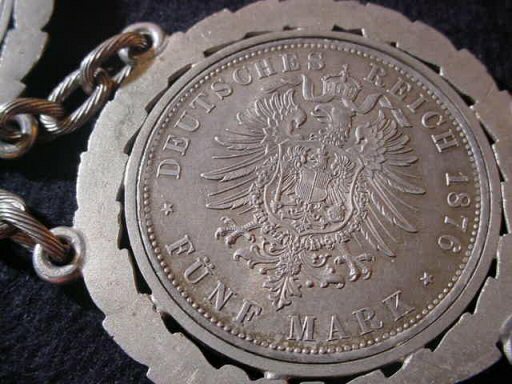 At the top is the royal Hohenzollern Prussian crown and around the rim are the words “Prinze von Preussen der Schützengilde zu Schoeneck, 1850.” Suspended at the bottom is another enameled badge with the Bavarian colors and the letter ‘A’ surmounted with the Bavarian crown. Could this ‘A’ be the initial of the most recent winner??? 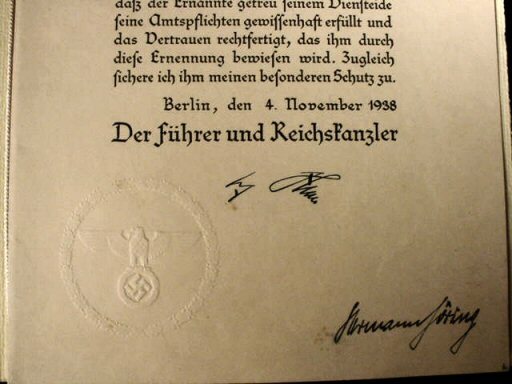 All in all this has to be one of the most beautiful and historically important items of Germanic interest that has ever appeared on our pages. It’s gorgeous and rare. 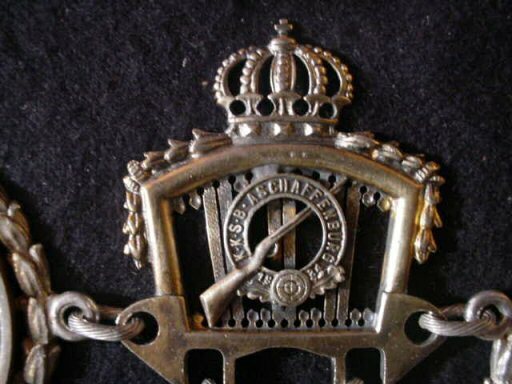 Here is without a doubt the absolutely most beautiful Schützenketten, shooting chain, ever found. 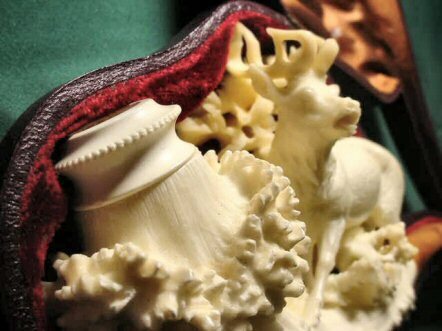 As far as we are concerned its beauty abounds in each and every piece that makes up its entirety. It would take pages to entirely describe each coin and medallion used to construct this utterly magnificent work of the silversmith’s art. 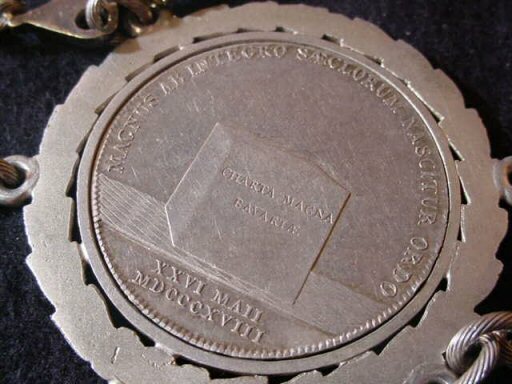 First of all, it needs to be explained that the main subject—the award—is always the central piece, while the supporting links are usually coins framed by the silversmith in such a fashion as to give emphasis to that highly coveted prize. 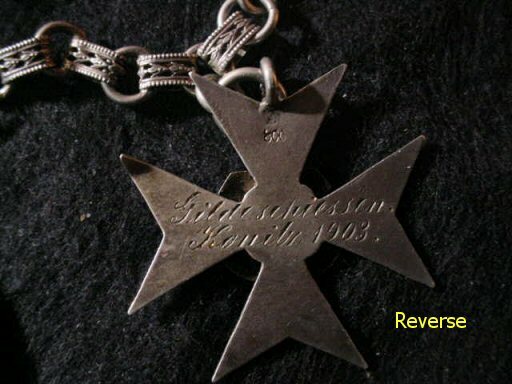 In this case we know the shooting king was from the town of Aschaffenburg because of two of the silver adornments. 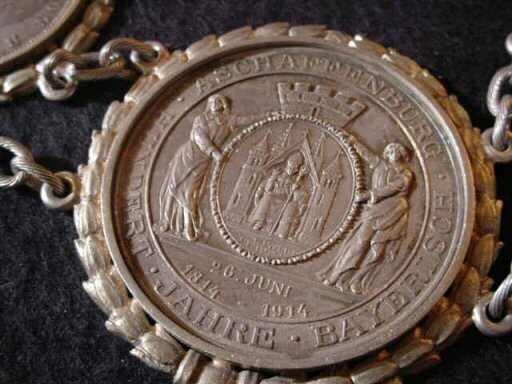 On the very back medallion which, by the way, is the largest of the medallions with the exception of the Prussian prize, which we will get to later. 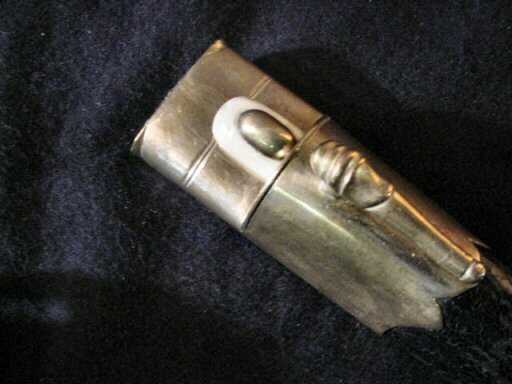 Also, this town is shown on what we call the central link, which is the silver-gilded piece with a rifle laying over a target with the Bavarian crown surmounting this. 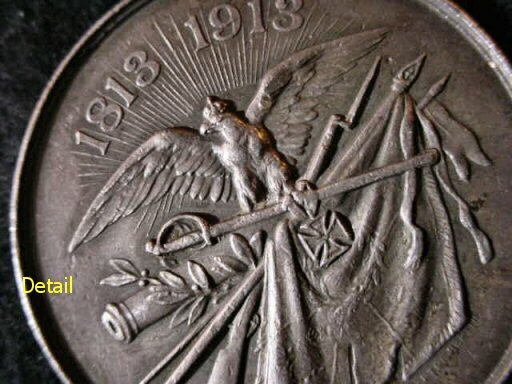 Some of the coins and medallions (nine of them) could be extremely rare and very valuable, but we do not have a way to check them out. 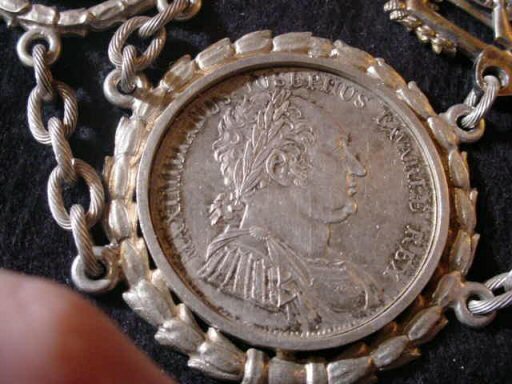 It is apparent that the man putting this chain together chose only pieces that were in almost uncirculated condition. The detail of these items is astounding. 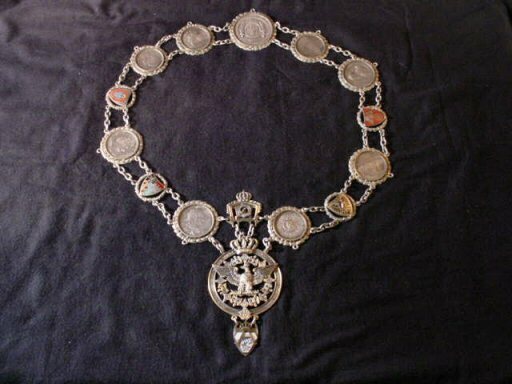 Four of them are 5-mark coins and the others are important medallions. The large Aschaffenburg piece at the rear is to commemorate the 100th year of the city’s becoming Bavarian. 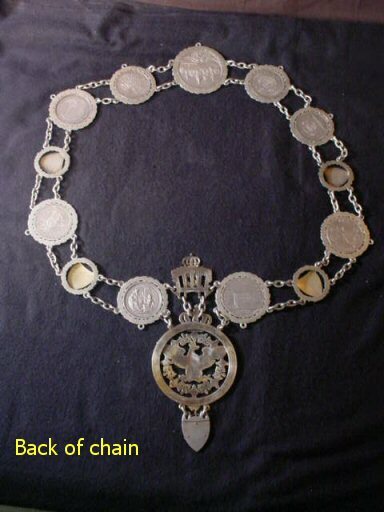 The entire chain gives evidence that the wearer was Bavarian. 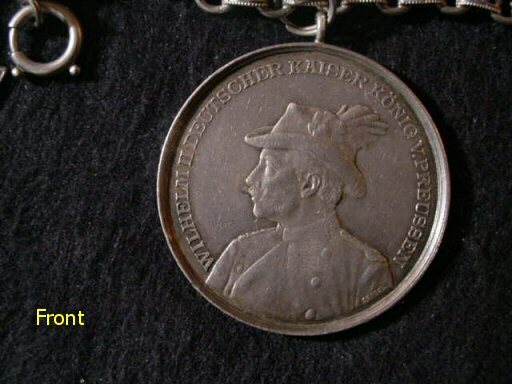 Bavarian coins and medals and the KKSB found on at least two piece show that the chain was produced and presented under the auspices of the group that was in a certain competition class: Klien Kaliber Schützen, Klasse B—Small-caliber Shooting, Class B. 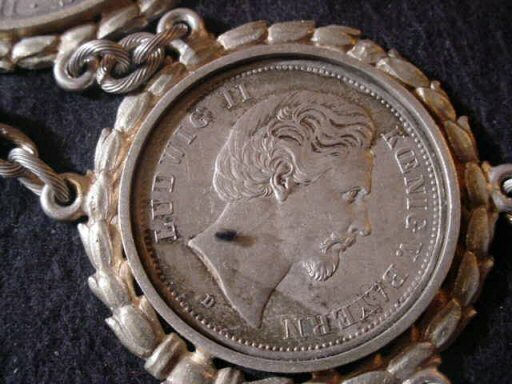 The latest date on the prize is 1924, on the item with the Bavarian crown. This is normal because the chains were often handed down when won by other winners through the years. 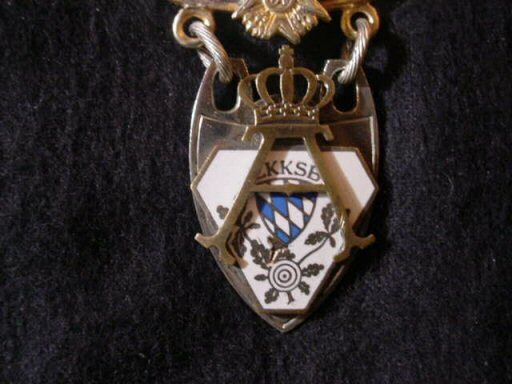 The enameled shields represent various Bavarian districts that have sponsored these shooting contests; however, in one case the enameled shield is Prussian and that leads us to the grand finale; the central badge that is the pendant (the largest piece) is personally presented to the Schützenkönig by the Prince of Prussia to someone who won top honors for a shooting contest sponsored by the Shooting Guild in Schoeneck in 1850. 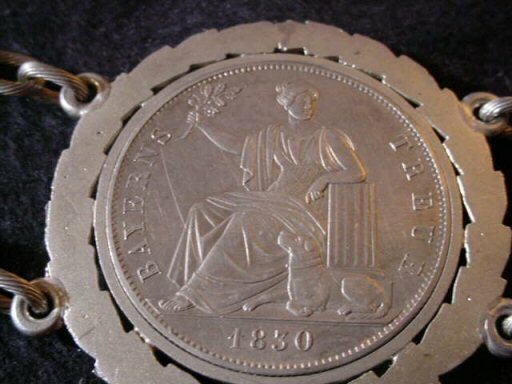 We are not sure if 1850 was the year of the actual award or the year that the contest and prize was instituted. 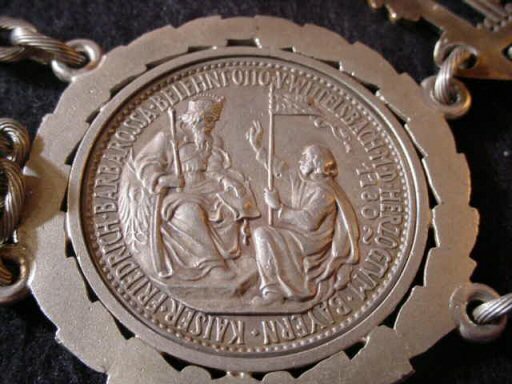 The medallion is astonishingly beautiful in genuine silver. 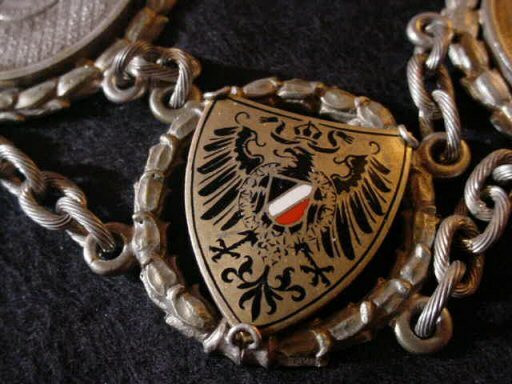 It features the royal Hohenzollern crowned eagle with the Order of the Black Eagle surrounding it. 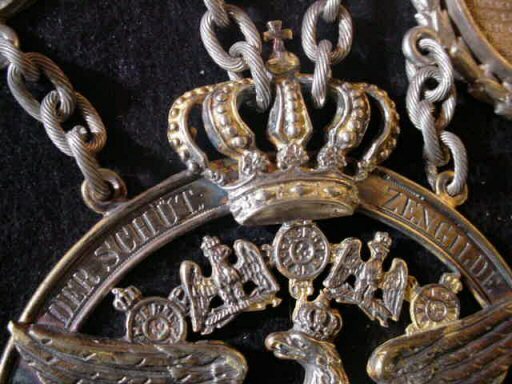 At the top is the royal Hohenzollern Prussian crown and around the rim are the words “Prinze von Preussen der Schützengilde zu Schoeneck, 1850.” Suspended at the bottom is another enameled badge with the Bavarian colors and the letter ‘A’ surmounted with the Bavarian crown. 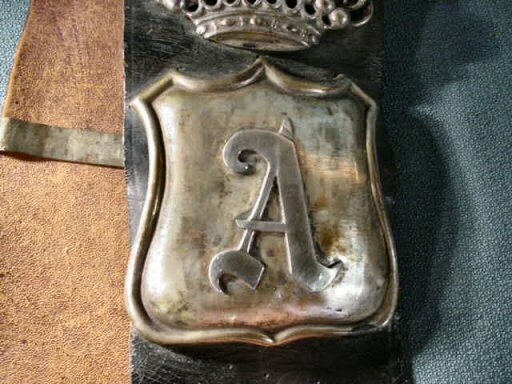 Could this ‘A’ be the initial of the most recent winner??? 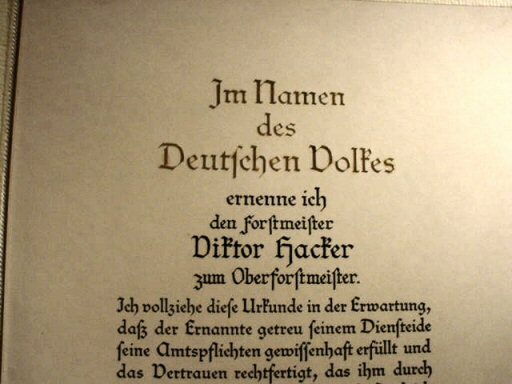 All in all this has to be one of the most beautiful and historically important items of Germanic interest that has ever appeared on our pages. It’s gorgeous and rare. 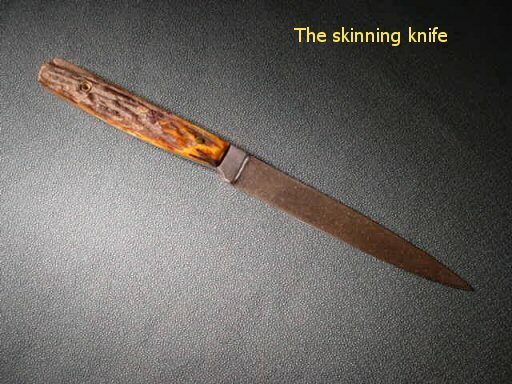 DESCRIPTION: Here is the classic Hirschfänger, or hunting dagger, as used in this style for centuries by German huntsmen. 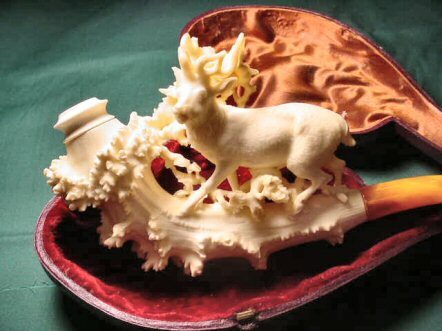 This, although very decorative, is actually the weapon used in the hunt on foot for the vicious Wildschwein or wild boar. 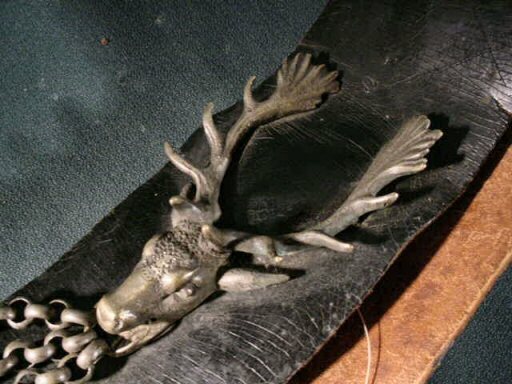 In the alternative it was often used from horseback in the hunt for the Hirsch, or deer; Hirschfänger meaning, literally, ‘deer catcher.’ Both of these risky sports involved much danger to the hardy participants of this Sport of Kings. 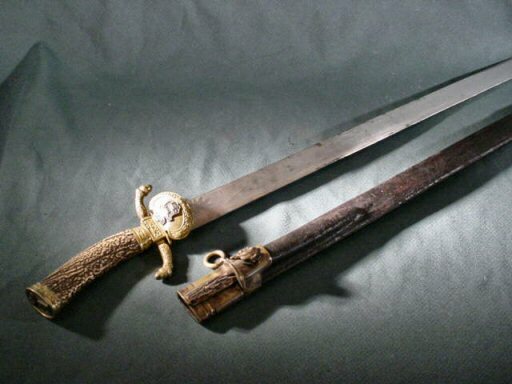 This is a sturdy weapon (it had to be) and probably belonged to a wealthy member of the landed gentry of noble heritage. 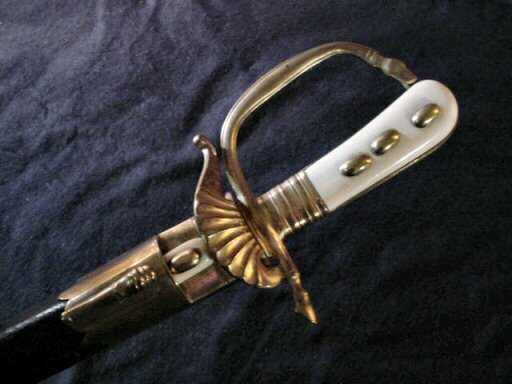 Because the grips are of genuine ivory, not celluloid, the blade is not engraved because it was actually used in the kill so blade embellishment was not necessary. 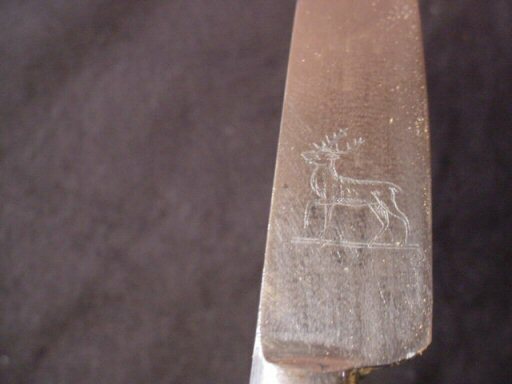 The supplier or maker’s signature line is on the back of the blade: ‘F & E Eisner Hoflieferant Berlin,’ meaning ‘…maker to the court Berlin.’ This expression is only to be used by a supplier to the palace of the Hohenzollern dynasty. 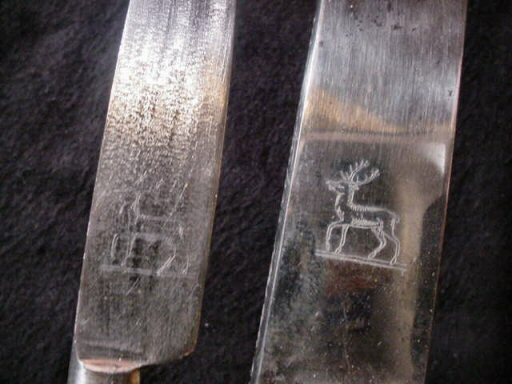 Evidently this Eisner company made at least a few hunting pieces for the Kaiser or the princes. 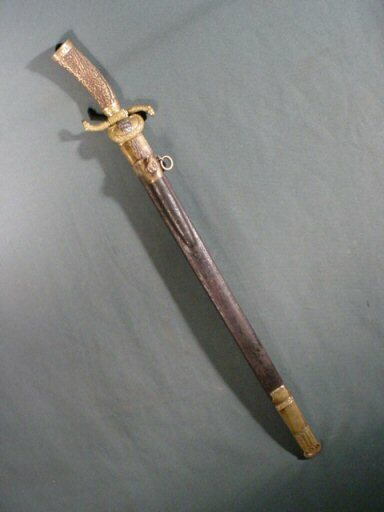 This is a rather large Hirschfänger in that it is 21 inches long in its scabbard with a 15-1/2-inch blade. 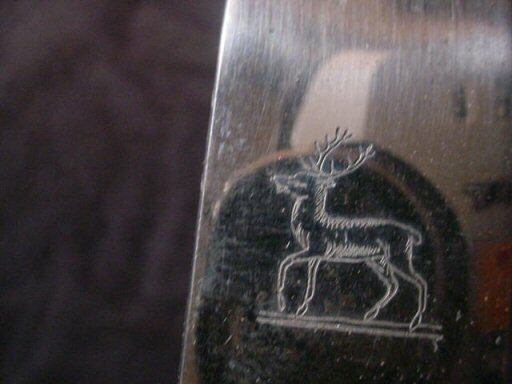 The skinning knife, usually missing, is not only there, but has the same royal stag depiction on its blade as has the larger blade. 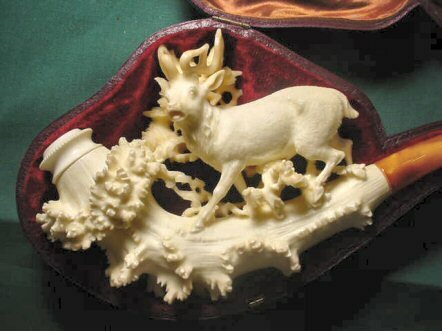 Its grips are also of ivory. 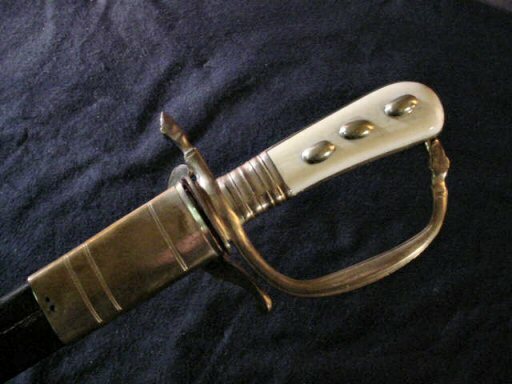 The scabbard is in very good shape considering its age, which lies between 1900 and possibly the 1930s. 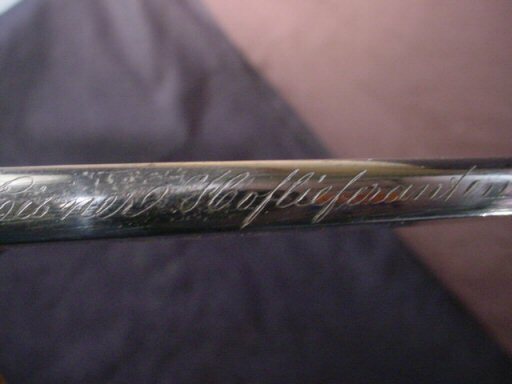 All in all, this is one magnificent Hirschfänger and you would be proud to own it. 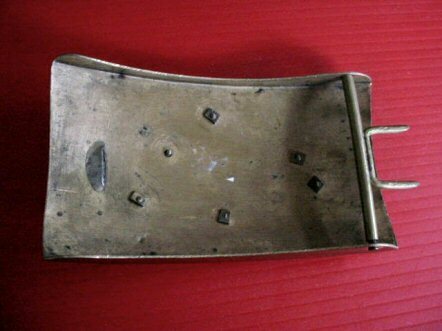 DESCRIPTION: Here is a beautiful chain device that would be worn on the traditional leather short trousers worn by the men of the Bavarian Alps. 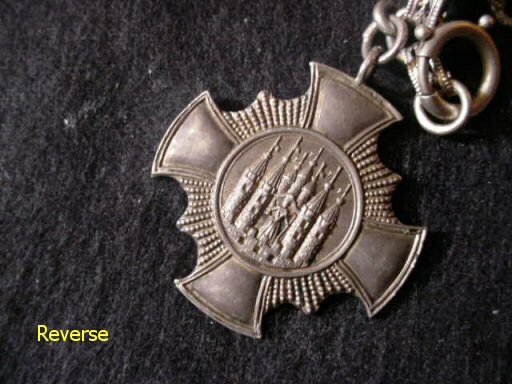 This one was probably the possession of a hunter or shooting enthusiast because the medals all commemorate shooting contests or particular guilds. 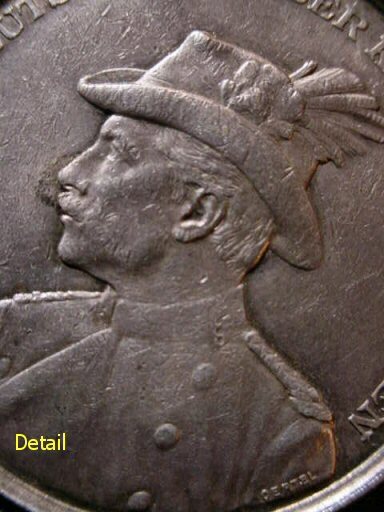 One of the silver medals of particular depicts Kaiser Wilhelm II in his hunting togs. 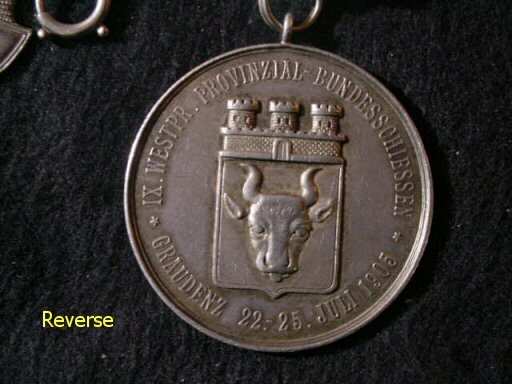 It is from a special shooting contest in Graudenz in 1905. 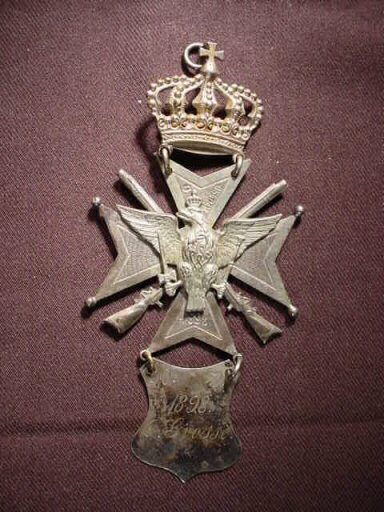 Another really nice one is form a provincial shoot also in Gaudenz in 1905, but this one has military connection showing the Prussian eagle with various flags, standards, and weapons. The other side has a scene form this town. From this locality it’s noted that the shooing guild in Graudenz was first instituted in 1671. 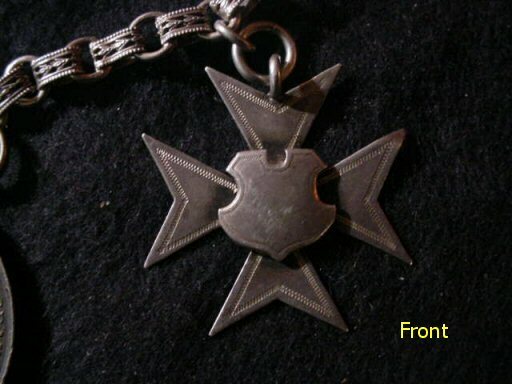 The Maltese Cross is from a Shützenfest Könitz in 1903. The district of Graudenz, where this shooter must have lived, was in Prussia. In 1945, after the defeat of Europe, the area was occupied by the reds and the old Germanic city-state became Polish. 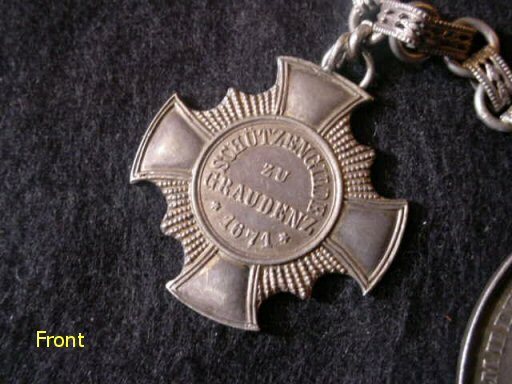 Originally founded by the Teutonic knights and chartered in 1233, Graudenz passed to Poland in 1466 and to Prussia in 1772 and then to Poland in 1919, then restored to Germany in the time of the Third Reich and then the tragedy in 1945. 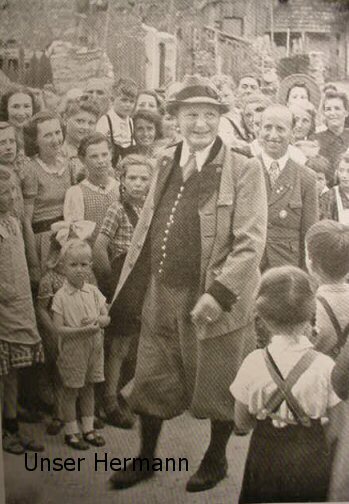 The citizens of Graudenz were always shooting enthusiasts. 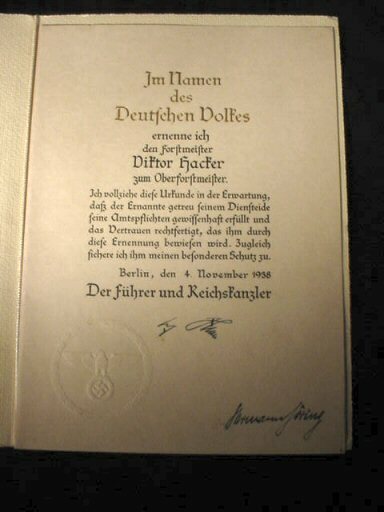 This is a nice important historical item.